Although I knew it was coming sooner than later, it was still a real kick in the stomach to read that Steve Jobs died today. I was at WWDC in June, one of his last public appearances, and I immediately saw how much his health had declined since the previous year. Yet there he was, leading us into the wonders of Apple’s next set of innovations involving iCloud and iOS 5. 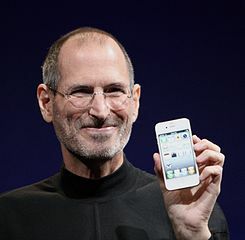 Steve was unique in both being devoted to beauty in computing and being able to sell that beauty to a mass market. It really started with the Mac, but the iPhone and iPad were even more profound. In the late 80s and early 90s there was a lot of experimentation about better ways to interact with computers than via a keyboard and mouse. I was involved in virtual reality, 3D graphics, sonification, and force feedback. Others were working on pen-based systems and speech recognition. None of it made it to the mass market at the time. Hardware manufacturers were fixated on Moore’s law and its application to CPUs, memory, and storage. Many other parts of what make up a computer system were neglected, including the key area of display technology. I’ve never seen anyone in the area of computer design with Steve Jobs’s sense of timing. The ability to know just when a particular innovation will be commercially viable, and when all the stars are aligned to turn something new into a big hit, is very rare. Some people get lucky once and invent something at the right place and the right time. With the iPod, iTunes, iPhone, and iPad, Steve Jobs led Apple to be in the right place at the right time for four major new product categories over a decade. This was on top of his earlier successes with the Mac and Pixar. What an amazing, astounding track record. When I started Recordare, the idea was to create a standard format to enable the growth of Internet music publishing and digital sheet music. We now have the standard MusicXML format in place and its surrounding application infrastructure. And now, thanks to Steve’s leadership and Apple’s work, we now have the iPad as a hardware platform for digital sheet music – the first mass market tablet good enough to criticize. FreeHand did pioneering work with the MusicPad Pro, but you need a mass market device like the iPad to be able to reach musicians everywhere. While the cause of Steve’s death is not known at this time, we do know that he suffered from pancreatic cancer several years ago. Pancreatic cancer is a quick and relentless killer with no pre-screening, no cure, and no effective treatment in the vast majority of cases. No matter how rich you are, you can’t beat it. One reason for this deadliness is that pancreatic cancer research is vastly underfunded. Please consider making a donation to the Pancreatic Cancer Action Network in Steve’s memory. This remarkable group works to increase pancreatic cancer research and awareness: to know it, fight it, and end it. Photo of Steve Jobs from WWDC 2010 by Matthew Yohe. This entry was posted in Obituary, Technology. Bookmark the permalink.